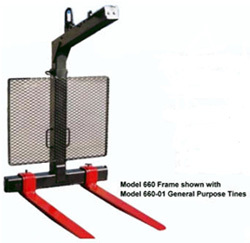 Crane Fork Frame with Backstop and General Purpose Tines (set of 2) are spring loaded to keep forks level when empty and maintain payload center of gravity to keep load level. Spring helps to return trolley to empty position when load is released. Design features include king post adjusts for load heights from 48" to 68", 40" wide backstop helps stabilize load, and forks spread up to 40" (out to out). Built-in handles on vertical post provide convenient grip for guiding forks into load. All forks are forged and tapered. The general purpose tines are the best choice for handling a wide variety of materials. The 46" forks are ideal for standard 48" pallets. Specs: tines 1.5" x 4" x 46"; capacity 6,000 lbs.